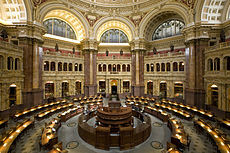 Although the Library of Congress stores over 100 million copies of books, journals, and films, the collection does not house every book published. In his article for the New York Times – In a Flood Tide of Digital Data, an Ark Full of Books and Film – David Streitfeld describes Brewster Kahle, a wealthy entrepreneur with the determination to create his own repository, a back-up collection in case of disaster. Comparing the fledgling project of 500,000 volumes to the Svalbard Global Seed Vault in Norway, Kahle hopes eventually to collect 10 million books in his archive from donations of books discarded from libraries, universities, and individuals. The Burlingame public library donated three hundred linear feet of Scientific American, Time, Vogue, and other periodicals to create space for their computer lab. Preserving the physical books is Kahle’s way of offering a time capsule for future readers; as a man who made his money by digitizing Web pages, he has more faith in the real book than electronic versions. What does that say about the future of e-books? This entry was posted in American history, books, essays, history, news article, reading and tagged Book Collection, Brewster Kahle, David Streitfeld, digital archiving, Kahle, Library of Congress, New York Times, Norway, Physical books vs electronic, Svalbard Global Seed Vault, Vogue. Bookmark the permalink. Yes, that is the point. Beware of trying to preserve those pictures on a CD too.